Play the 'ultimate' worm/snake game! This addictive VGA MS-DOS game will play on almost any PC, from an aging 386 all the way up to the latest Pentiums. Features upto 3 players, lasers, levels, power-ups and lots, lots more! 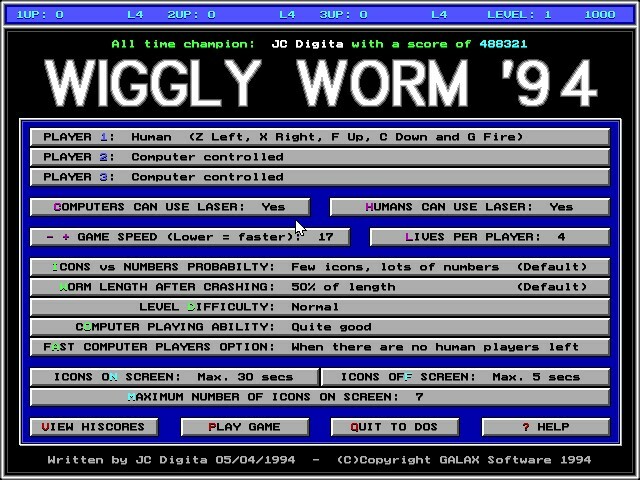 Wiggly Worm '94 Special Edition is no-longer Shareware - It's now been re-released as free software under the GNU General Public License.